Spencer & Locke #2 - Review - NewRetroWave - Stay Retro! | Live The 80's Dream! One of the best components of the debut issue of Spencer & Locke was the artistic shift between a grittier contemporary comic art style and the clearly Calvin & Hobbes-influenced Sunday paper strip aesthetic. Rather than being a spontaneous artistic flourish, it had an unsettling effect that really reinforced the kinds of behaviors that made protagonist Locke who he is in the present. Within a few pages, Spencer & Locke #2 does an exemplary job of using the same stylistic shift in a brand new context, using the Watterson style as a cold open. Instead of highlighting the moderately unhinged aspects of Locke’s personality, this open goes a long way in giving the character whose only confidant is a plushy doll a great deal of humanity, enough so that the character is likable and sympathetic as he beats the hell out of the former bully and forced informant Stanley. The scene is a microcosm of the relationship between heart and brutality that writer David Pepose uniquely excels in and which artist Jorge Santiago Jr. consistently reinforces. The comic picks up with Locke’s continued investigation into the murder of childhood sweetheart Sophie Jenkins, referred to in narration as “my girl”. In my review of the first issue, I mentioned how Locke never grew out of stuffed plushy panther Spencer as a comfort item. In a lot of ways, his tight grasp on Sophie’s memory serves the same function. It’s a remnant of a simpler, Watterson-drawn time, albeit one that flashbacks are revealing to be increasingly dysfunctional. Upon breaking into the boss’s suite of the Red Rose gentleman’s club, Spencer evaporates at the re-introduction of Ramona, Locke’s sexually abusive babysitter. To be clear, Pepose is playing with some highly flammable content in both this scene and the cold open. Writing about sexual abuse, especially in the case of minors, can very easily become offensive or cause a reader to just nope out of the rest of the series. The comic handles the scene of Locke experiencing PTSD with uneasy grace, showing it side-by-side with Sophie’s daughter Hero being kidnapped and screaming for help. The narration of Locke exclaiming “The kid!” and cutting off Ramona’s unwanted advances mirrors the opening scene of his abuse so perfectly that it genuinely feels like David Pepose is showing off. Ramona is still Ramona, but now Locke is the boyfriend, and Hero is the kid who desperately needs saving. Jorge Santiago’s illustration and framing of Ramona in what is initially a seductive, femme fatale light is an interesting choice in the context of this scene. The tropes of the genre gear the reader to expect sexual tension out of the scene and for there to be a, for lack of a better word, shipping of the cynical anti-hero and damaged femme fatale. Making the latter a sexual predator and making the former the victim is really interesting and takes noir in a thematic direction that it has never been before, which in 2017 is no small feat. 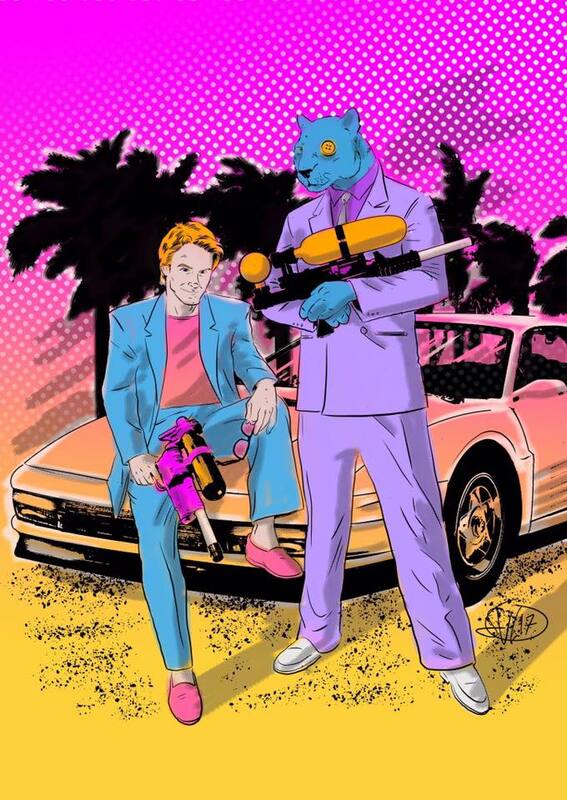 Spencer & Locke fan art by Sean Von Gorman, how could I not share this? Santiago lets loose with noir aesthetic in this issue, reveling in the under-discussed noir staple of Dutch angles. They never become overbearing or nausea-inducing with overuse, but rather reinforce the foreboding and oppressive atmosphere. His style is more cartoon oriented than realistic, which serves the comic well. The panels where he’s given room and doesn’t have to worry about accommodating dialogue or narration are particularly gorgeous, with the page of Locke’s car flipping over a panicked Hero being the best in the issue. Jasen Smith’s color work is equally effective in reinforcing the mood of the comic. Smith’s use of blues and reds in particular throughout the issue give it a visual sense of flow that makes subversions of that palette, like when Locke shoots Ramona, extremely effective. 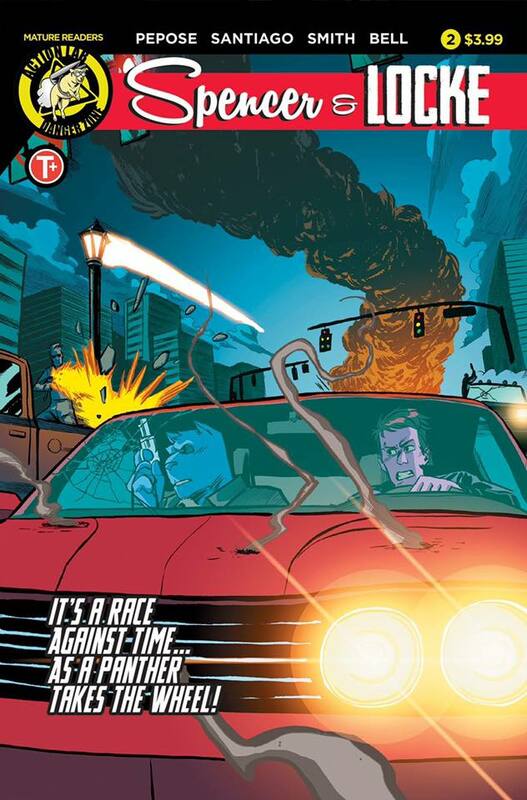 A lot of the marketing and reviews for Spencer & Locke include phrases like “for fans of Sin City and Calvin & Hobbes“, and while that is certainly fair, Spencer & Locke #2 establishes the title as something that is not just a blend of its influences, and puts it on the track for future comic titles being described as “for fans of Spencer & Locke“. This is easily one of the best comics of the year and is definitely a comic worth seeking out and jumping into.